NoNameStocks: Why is TIK so cheap? Why is TIK so cheap? Tel-Instrument Electronics (TIK) is extremely undervalued based on the most recent quarter, pre-announced next quarter, and order backlog. Let's take a deeper look to see if it's still cheap. TIK is a high growth microcap company that designs and manufactures avionics test equipment. Their largest customer is the US military, accounting for 89% of the most recent quarter's revenue. TIK has three major programs: CRAFT for the Navy, TS-4530A for the Army, and ITATS for the Navy. The TS-4530A program is split up in two parts: SETS which are a complete new units and KITS which are an upgrade of an old unit. 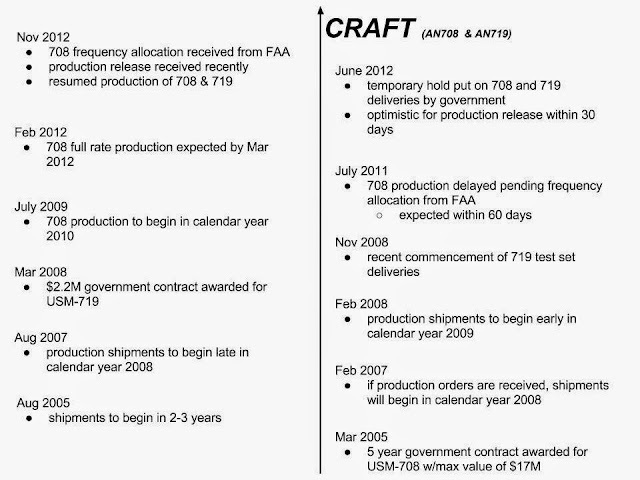 The CRAFT project also has two parts: the 708 product and the 719 which is a subset. I will let you visit the TIK website to learn more about these products but basically they are Mode 5 avionics test equipment. Mode 5 is the latest standard that the US Military is migrating to as we speak; in the past there was Mode 1, 2, 3, etc. TIK has only one competitor in the Mode 5 space, Aeroflex, but TIK has the upper hand since they have all the big U.S. government contracts. The most recent quarter's numbers were great. They did $5.03M in revenue which is an increase of 23% YOY and 40% sequentially. That translated to a non-GAAP EPS of $0.09. They recently pre-announced Q4 revenue of $6.4M and I have heard estimates that will come in with non-GAAP EPS of around $0.30. Recently the company has talked about getting to $7M per quarter. A recent SA article puts next year's non-GAAP EPS at $1.40 which would means you can buy for a forward PE of around 4x (given the recent price of $5.75). The SA author has been pretty accurate with his TIK numbers lately but even if he's way off and the EPS comes in at $0.70 we still have a forward PE of only 8x. 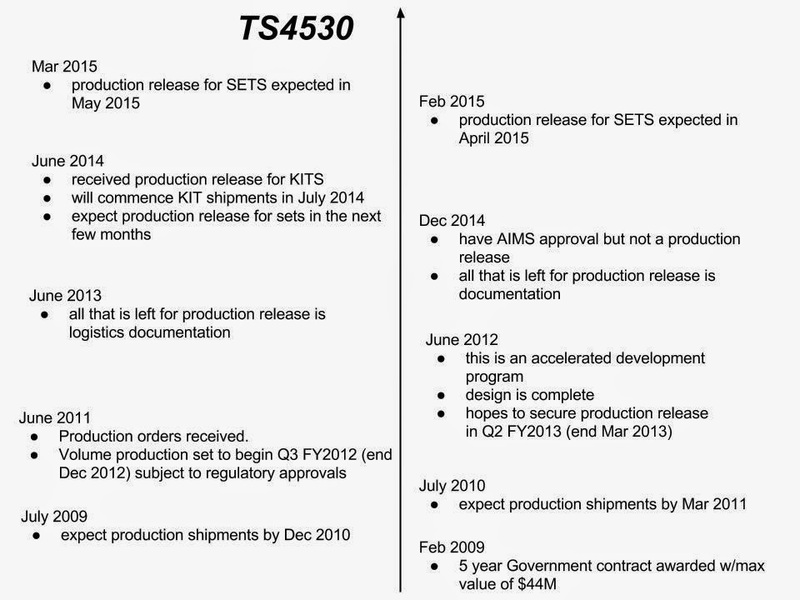 TIK started TS-4530A KIT production in July 2014 and only finally got to full rate production on ITATS in December 2014. 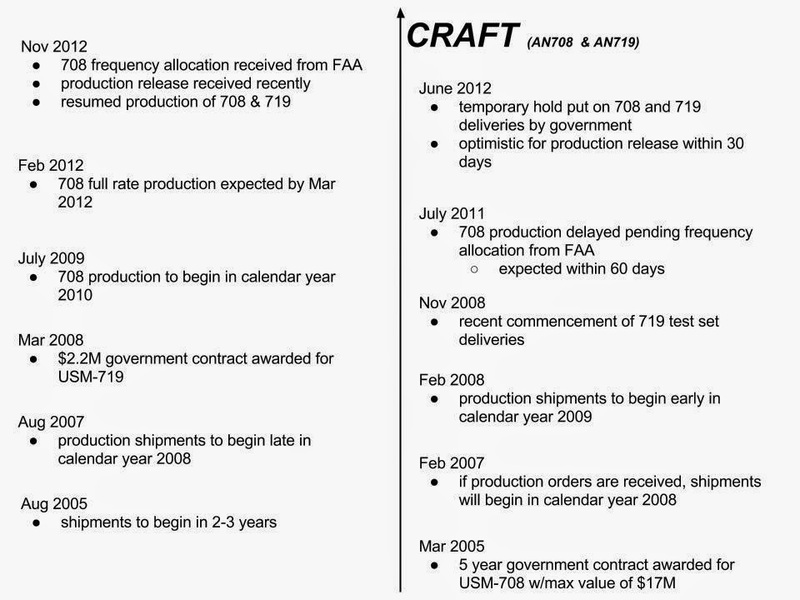 CRAFT has been in production since the end of 2012 and after some production issues they are going full steam. The recent uptick in revenue is a result of the 3 programs all finally being in production together and the path to $7M quarterly revenue is getting the TS-4530A SETS into production. The company expects to receive a production release on TS-4530A SETS in May 2015, but we will talk more about that later. The most recent quarter's backlog stands at $32.6M. If TIK averages a quarterly revenue run rate of say $6M then we have 5 1/2 quarters right there without any new orders. If TIK achieves the $7M per quarter that the CEO mentioned then we still have over a year of work just from the backlog. When I look at TIK I see an undervalued security based on the most recent data. If the company continues with quarterly revenue of $6-7M then it should be priced much higher. The first question I ask myself in a situation like this is "why is it so cheap?" What do I know that other don't? Why am I being given this opportunity? So let's go deeper into the story to figure out why it's priced so low and whether it deserves a higher valuation. 1. Broken promises from the past 10 years. Investors have been told over and over that production and profitability are right around the corner for too long. 2. Aeroflex litigation against TIK. Aeroflex has filed a lawsuit against TIK claiming that TIK stole their intellectual property (IP) for the TS-4530A program. Trial is currently set for Feb 2016. 3. Revenue beyond the current backlog is unclear. TIK has orders for about as many units as they can produce over the next couple of years but what happens after that? The story of TIK is really the story of their big 3 programs. These programs make up the bulk of TIK's revenue and without these this would not be an interesting stock story. All of the dates and messages in the timelines below come from TIK's SEC filings. Over the past decade, TIK investors have been told over and over that production (and hence, profitibility) were right around the corner. The dates were continually backed up. TIK is finally now most of the way there but it has taken much longer than originally quoted. I want to be clear that I do not think TIK intentionally mislead anyone, but rather I think they underestimated what it would take to get to full military approved production on these programs. I asked the CEO why these programs took so much longer than expected. He said that CRAFT and TS-4530A were out of the ordinary because their suppliers (for the transponders I think) were developing hardware at the same time. There were also some direction changes from the military in the middle of development. CRAFT was the first of the big 3. TIK won the contract in March of 2005 and made it to production in Nov 2012. This is the project that laid the ground work for TIK's Mode 5 presence. It was this project that helped TIK win the TS-4530A contract (more on that later). I think a pictorial timeline will help illustrate the feelings of shareholders along the way. In Mar 2005 they were told that the project would be over in 5 years and soon after were told production shipments would commence in 2008. Well production claims were backed up more than once and eventually TIK made it there 4 years later than the 2008 claim, at the end of 2012. There was a hold up in July 2011 with the FAA frequency allocation that TIK claimed would be resolved "within 60 days" yet ended up taking about 16 months. Actually this is still not resolved, though it's out of TIK's hands. In late 2012 the Navy was given interim frequency allocation but they still have not been given full allocation from the FAA; this just means the units have to be run in tethered mode right now (connected to the aircraft rather than wireless). One thing that lengthened the CRAFT timeline was the introduction of the 719 product. The original craft award was to be fulfilled by the 708 product. In the middle of the program (2008) the Navy decided they wanted something to come to market quicker so they selected a subset of the functionality and issued the 719 contract award. 719 came to production quickly but the 708, unfortunately, did not. TS-4530A was the second of the big 3. This is the largest contract of the 3 and is the only one not yet completely in production. TS-4530A also triggered the lawsuit from Aeroflex which we will discuss later. This project is an update to the previously existing TS-4530 test set used by the Army, bringing the unit up to Mode 5 capable. Aeroflex built the old TS-4530. Aeroflex and TIK were the two bidders for the TS-4530A upgrade contract. I think a big reason TIK won the contract was their already existing US military Mode 5 contract for the CRAFT program. TIK won the contract in Feb 2009. Production shipments were first expected to start in 2010. Soon after, TIK was saying volume production would begin at the end of 2012. Once again TIK was way off on their estimates and here we are today, May 2015, without a production release of the SETS. TIK received the production release for KITS in June 2014. A few months ago we were told to expect the production release for SETS in Apr 2015 then that got pushed back to May... and so it continues. ITATS is the last of the big 3. This is also the only program not completely designed in house. I am not sure the reasoning but for this program TIK outsourced some of the work. Once again you can see the incorrect timing estimates and broken promises. The contract was won in July 2006 and soon after we were told to expect production shipments in 2009. The production release was expected in 2010 then 2012 and finally received in the summer of 2013. 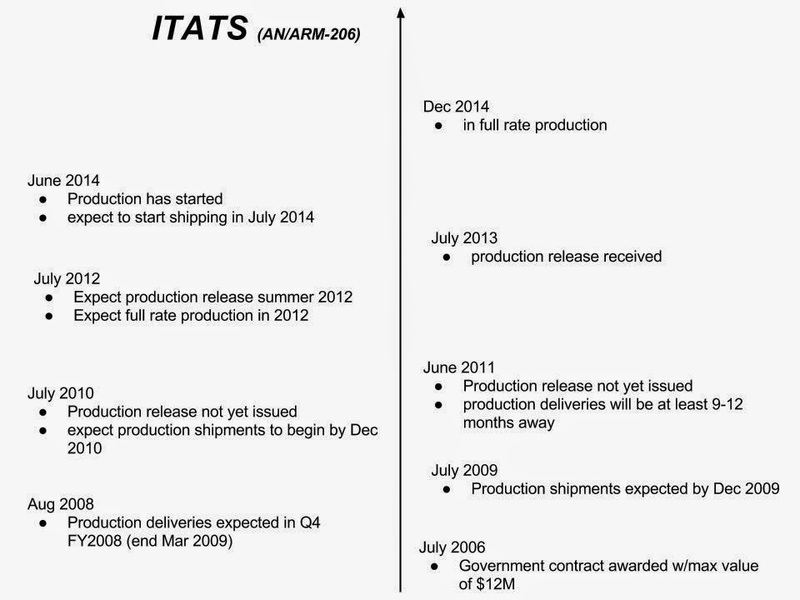 ITATS is now in full rate production as of Dec 2014. As you can see, TIK has been less than stelar with timing estimates over the past 10 years. I think this has turned off investors and kept TIK's share price low. Even now we are waiting on the production release for the TS-4530A sets which is due to arrive any day now, but when do you think it will really come? The largest near term source of potential downside to TIK is a lawsuit against them from their primary competitor, Aeroflex. As I said before, the big 3 programs currently account for most of TIK's revenue and judged by the size of the original contract, the TS-4530A program is bigger than the other two combined. My research into this litigation has come from the case files and the little blurb in their 10Q/Ks. I received the case (about 130 scanned documents) from the Sedgwick District Court in Kansas then spent a lot of time reading. Let me first say that I am no lawyer and I have no law training. Do not take any legal advice from me and please come to your own conclusions. I did ask a lawyer about a few things but that's it. It will be easiest to explain the lawsuit, and Aeroflex's side of the case, with another timeline. The lawsuit was initiated by Aeroflex shortly after TIK won the Army contract to upgrade the TS-4530 to Mode 5. Aeroflex won the original TS-4530 contract in 2003. In 2005 - 2006 the Army issued then retracted 3 separate sole source awards for Aeroflex to upgrade the TS-4530 to Mode 5 because they believed Aeroflex was the only company that could perform the upgrade. However, TIK filed a protest after the 3rd sole source award saying that they could do the upgrade. So the Army retracted the sole source award and prepared to issue a request for proposal which multiple companies could bid on. In the mean time, TIK hired two key Aeroflex employees and then won the contract. 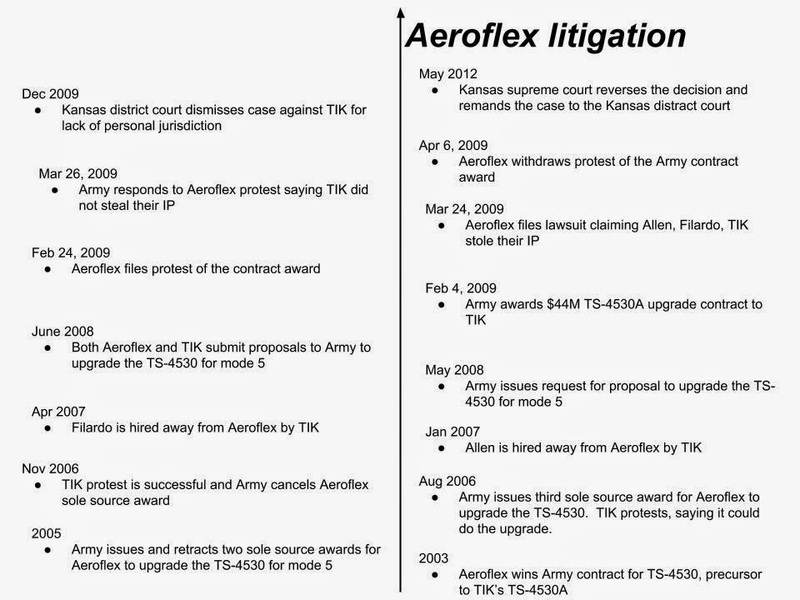 Soon after the contract award, Aeroflex filed a protest with the Army and a lawsuit in the District Court of Sedgwick County, Kansas, claiming that TIK stole their intellectual property and the two former employees violated their confidentiality agreements. The Army responded to the protest in TIK's favor, saying that they do not believe TIK stole Aeroflex's IP, then Aeroflex withdrew their protest with the Army. The lawsuit is ongoing. The district court ruled that TIK was not under their jurisdiction since they are not located in Kansas but the state supreme court disagreed with that and now the case is back before the district court awaiting trial. Currently the trial date is set for Feb 29, 2016, but I wouldn't be surprised to see that pushed backed further. So far the trial date has been set 7 different times. Recently the trial length was extended from 9 days to 3 weeks, but I don't think we can read much into that other than note there probably is more testimony than originally anticipated. I don't think the district court's original dismissal for lack of personal jurisdiction means anything. Yes it was a 'win' for TIK but all it meant was the court didn't believe it was the right place to hold the trial. TIK argued that they are a small company located on the east coast and the trial should happen there, if at all. There was contention about what Aero had to show to establish a Kansas court's jurisdiction; at first the district court agreed with TIK that Aero did not show enough but then the state supreme court agreed with Aero that they had shown enough. Whatever. Either way the trial would have just been moved to another state or court. Aeroflex's basic complaint seems to be: we don't understand how TIK could do this upgrade without stealing our IP so they must have stolen our IP. Aero claims that TIK hired Allen to get to Filardo and specifically hired the two of them to steal Aero's IP then win the Army contract. Allen is a project manager or sales type of person and Filardo is now TIK's Director of Engineering. Aero makes it sound like Allen and Filardo were both key members of their TS-4530 Mode 5 upgrade team. Aero claims Allen was working on the pricing structure and took that knowledge to TIK which enabled them to undercut Aero's bid. Aero claims Filardo was a key engineer who knew the complete design and gave that knowledge to TIK. Aeroflex owns the design for the original TS-4530 and the Army contract is to upgrade this unit with Mode 5 capabilities while retaining the "fit and function" of the original. Aero claims that this could not be done without intimate knowledge of their hardware and software. Looking over the timeline of events, it is suspicious that Allen and Filardo are hired so soon after TIK's protest of Aero's award was successful. From Aero's point of view it looks like when TIK learned they could submit a bid for the TS-4530 upgrade they immediately recruited the main guys from Aero's TS-4530 team. As far as Aero's protest of TIK's award with the Army, Aero claims that was just not the right place to fight this fight. Aero says that it's in the Army's best interest to find that TIK did not steal Aero's IP because that backs up the contract award already given to TIK. So of course the Army would say they don't think TIK stole IP. Aero says they withdrew the protest with the Army because they felt that a court was the right place to take this argument rather than the Army. 1. TIK was awarded the CRAFT contract in Mar 2005, more than a year before filing the protest of Aero's sole source award for the TS-4530 upgrade. So TIK was already working on Mode 5 capabilities and therefore had no need to steal Aero's IP. TIK claims they already had working Mode 5 technology in place. That is why TIK filed the protest and believed they could do the job. That also gave TIK leverage to help convince the Army that they could handle the TS-4530 upgrade. TIK says "This TIC Mode 5 technology was completed and demonstrated well before the arrival of either Chris Allen or Dr. Filardo at TIC." 2. TIK's plan for the upgrade was to gut the existing unit while retaining only the carcass. So once again TIK claims they had no need to steal Aero's IP. TIK's original proposal to the Army stated that it would in fact be a benefit to gut the old unit because it "does not restrict us with the older legacy technology design but allows us to use the latest cutting edge technology available." TIK goes as far as to say they are using the same board inside the CRAFT unit and the TS-4530A. "...the Army's conclusion...is that TIC's approach as set forth in its proposal is acceptable and will not necessitate an infringement of Aeroflex's propreitary rights. Aeroflex made two erroneous assumptions in formulating its protest against award of the contract to TIC. First, Aeroflex assumed TIC must have modified Aeroflex's proprietary hardware. Second, Aeroflex assumed TIC must have modified Aeroflex's proprietary software. As to hardware, TIC completely gutted the RTS and replaced the hardware with a single printed circuit board design utilizing new hardware components. ... As to software, the software TIC utilized is based on software developed internal to TIC and currently being used on similar Mode 5 equipment used elsewhere within the DoD." 3. So far Aeroflex has not produced any proof of wrongdoing. Aero claims TIK has stolen trade secrets while Allen and Filardo have violated their non-disclosure agreements but they offer no proof. 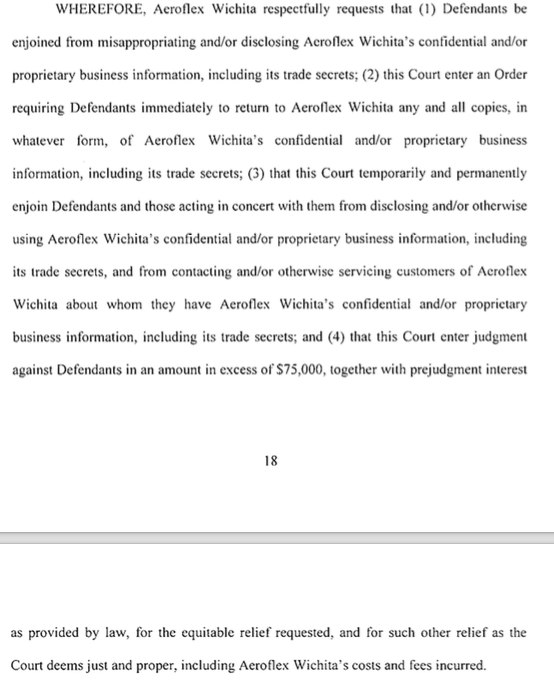 Aero's original complaint says "Upon information and belief, TIC misappropriated Aeroflex Wichita's confidential and proprietary business information..." Aero later restated the complaint without the "upon information and belief" line but the idea is the same. It seems Aero is claiming TIK stole their IP based only on a belief that TIK must have done it and then Aero is hoping to find proof as they go through discovery. "Despite conducting discovery the plaintiff has produced no evidence Filardo misappropriated plaintiff's confidential and proprietary business information while working in Kansas and in fact the U.S. Army's investigative report rejected the plaintiff's claims. The evidence supports a finding Filardo worked on developing TIC's own proprietary software for the bid." "In those discussions, Filardo asked Allen: 'Do you think Aeroflex will provide the capabilities to decode all registers as they do in their current commercial product?' And Filardo asked Allen 'What multiple target capability do you think that Aeroflex will include?'" These two sentences don't seem like much proof to me but I'm not a lawyer and I don't know what instructions will be given to the jury. 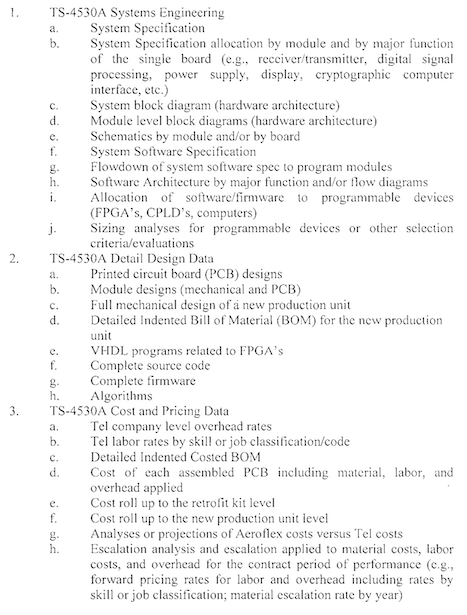 In June 2013, TIK said they have given up 9274 pages of documents, including the original TS-4530 upgrade proposal for the Army, during this case and "they are drawing a line in the sand" here such that they will give no more "when Aeroflex has not described with specificity the trade secrets it alleges were misappropriated." Are these two sentences all that Aero found in 9274 pages of documents? In July 2013, Aero says they submitted a "19-page, single-spaced, detailed description of the trade secrets at issue in this lawsuit." I cannot find this 19 page document so I think it is hidden from public record for the time being. I do know that the discovery phase has been ongoing since 2013 so maybe Aero convinced the court to make TIK give up more info. I am no lawyer, but it just does not seem right that TIK would have to give up all its designs to a competitor just because the competitor is suing without proof. But then again maybe Aero has found enough proof through further discovery as time has gone on. I believe the $75k is a court minimum and Aero will ultimately ask for much more. They are asking the court to stop the defendants from using their stolen IP. The TS-4530A contract was worth a max of $44M and if Aero wins then they could make the argument that should have gone to them. I can't imagine the Army allowing an Aero win to stop production on their order so if Aero were to win this lawsuit I think the likely resolution would be a major monetary penalty as well as some sort of license fee for any further products sold. Needless to say this would be devastating for TIK. I wonder if this would bankrupt TIK so that Aero could buy them up. The military contracts are defined as Indefinite Delivery Indefinite Quantity (IDIQ) with a certain maximum dollar value. The military issues purchase orders against these contracts for a certain number of units. Right now there is 17.1+2.4+2=$21.5M worth of orders the military could issue against the current IDIQ contracts which would take another year or so for TIK to get through. So based on the current contracts TIK will be going all out for another 1-2 years. That does not include any other business, but as I said these 3 programs make up the bulk of TIK's revenue. Beyond the current backlog several things could happen to generate more sales, let's list them then discuss. Note that all of these will lead to higher margins as the initial contracts are given at a lower price. The military could issue further IDIQ contracts for these programs. I don't know how many units the military needs in total or how this number might change in time so I don't know how likely this is to happen. They have issued add-on IDIQ contracts in the past, for example a follow on $9.5M IDIQ contract for CRAFT was issued in 2013. TIK could successfully translate these military products over to the commercial side of the business. I don't know how to judge the potential market for this. TIK could receive orders for these products from outside the US Military. The CEO has told me that TIK's next big goal is to translate the military programs over to the commercial business which they've been ceding to Aeroflex over the past 5 or 10 years. He said that 10 years ago TIK's revenue split between military and commercial was about 50/50 and now it is more like 90/10. Outside of the US Military there is will be an international market and the Joint Strike Fighter (JSF) program. On the international side of things TIK will be competing with Aeroflex while they will not likely have much competition on the JSF side. Since TIK has won the US Military contracts they have the upper hand in outside sales, why would any other government choose Aeroflex if the US has chosen TIK? I asked the CEO to quantify this market and he said for CRAFT there may be 2000 units for the international market and 1000 for JSF. If we say TIK gets 75% of those orders then that is 2250 units which would take 7.5 years to get through at their current rate of production. He told me there is a similar market for TS-4530A but did not get into specific numbers and he did not comment ITATS in this regard. "The transition to the new Mark XIIA Mode 5 avionics equipment and support equipment is now in process and will entail a major effort for the U.S. military and all participating NATO countries over the next 10-15 years. TIC is proud to be a part of this milestone avionics system development effort." I believe there is a madate for all NATO countries to upgrade to Mode 5 by 2020, and the CEO told me he expects them to upgrade in this time frame. I asked about the "next 10-15 years" comment on their website and he said he does expect CRAFT and TS-4530A to generate revenue for that long but the rush to upgrade will probably be over by 2020. He said the Mode 5 market in general will probably last for the next 20-30 years. So how much revenue are we talking about here? Well I have gathered various prices for the different products. CRAFT 708: $22k-$30k for the current US military orders, $36k for the latest Lockheed order. CRAFT 719: CEO told me $28k. TS-4530A: CEO told me it's in the $18k-$22k range. ITATS about $53k. If TIK does get 2250 orders for CRAFT at $36k each that is $81M. Let's say the rush does happen in the next 5 years so TIK gets 70% of those orders, that'd make 315 units per year over the next 5 years which is right around their current production rate of 300 units built per year. That would be about $11M annually for the next 5 years, just from CRAFT 708. That could not start until they make it through the current backlog so from now we are talking about having CRAFT fully ordered at full production rate for the next 6-7 years. As for TS-4530A the CEO told me it'd be 'similar' to CRAFT but I am not certain what he meant by that. If he meant similar quantities then if we just adjust the CRAFT numbers for the TS-4530A price of $20k we end up with 11*20/36=$6.1M annually for the next 5 years. If he just meant 'similar' in that there's a international and JSF market then I don't know how to judge the potential market size. I suppose if we are figuring CRAFT will be going full bore until around 2020 then maybe 'similar' means TS-4530A will be as well. So what does the future hold? That is always the question. With this company I see a wide range of possibilities. As far as the lawsuit, it seems to me that TIK did nothing wrong and Aero is just upset about losing the contract. Aero is the bigger company and so maybe they are just trying to bury their smaller competitor in legal fees. When I spoke with the CEO he said he was more worried about how much the lawsuit will cost them than the trial result. He seemed confident that TIK had done nothing wrong. I don't see any proof from Aero but then again I don't have access to all of the documents. If Aero has in fact found proof during discovery then maybe they can win the case. At a minimum there have been enough discussion points unearthed to extend the trial from 9 days to 3 weeks. From the current situation thiis lawsuit gives TIK nothing to gain and a whole lot to lose. What if Aero wins the case? I don't know how to judge the potential monetary penalty but if TIK has received $27M in revenue from a product built using stolen IP then could the penalty be $5M? $10M? $20M? For a $19M market cap company the penalty could be huge. On the upside, TIK may do really, really well over the next few years. First off all there is winning the Aeroflex lawsuit. Then in the best case maybe TIK exceeds the $7M quarterly revenue the company has recently discussed, so let's say they do $7.5M quarterly. If they get 3000 international and JSF orders for CRAFT as well as a 'similar' amount for TS-4530A and ITATS then this quarterly revenue could be sustainable without any further products for the next 5-7 years. If on top of that the company is able to successfully translate this Mode 5 technology into the commercial space and get back to a 50/50 split then this quarterly revenue would go up to say $12M. This is a lot to go right so maybe not that likely but still a high side possibility. The worst case comes down to the simple binary action of TIK losing the case, so let's say Aeroflex wins the lawsuit which causes TIK to completely lose the TS-4530A program. Since TIK has said they are using the same board for the TS-4530 and the CRAFT programs I suppose it's possible that both programs are lost. Within a year or two TIK would be done with the current backlog and in this scenario there is no more CRAFT or TS-4530A. If there are no more military versions of CRAFT and TS-4530A then there are also no commercialized versions so after the current backlog the company is basically done for. The trial date is set for next year so we get one year of ~$6M quarterly revenue and then it'd be a money losing operation. At this point I don't have to go any farther. The worst case that I can think of is a total loss of capital: TIK losing the trial and along with that their TS-4530A and CRAFT programs. I'd say this is not the likely scenario but it is possible so I cannot invest. I think it's likely TIK does very well over the coming years but until this lawsuit is out of the way I can't be involved. I will keep watching the situation.